Phila. 's icy forecast called for salting, not scraping. It was not a popular decision. Getting around Philadelphia was tough yesterday no matter what your wheels. 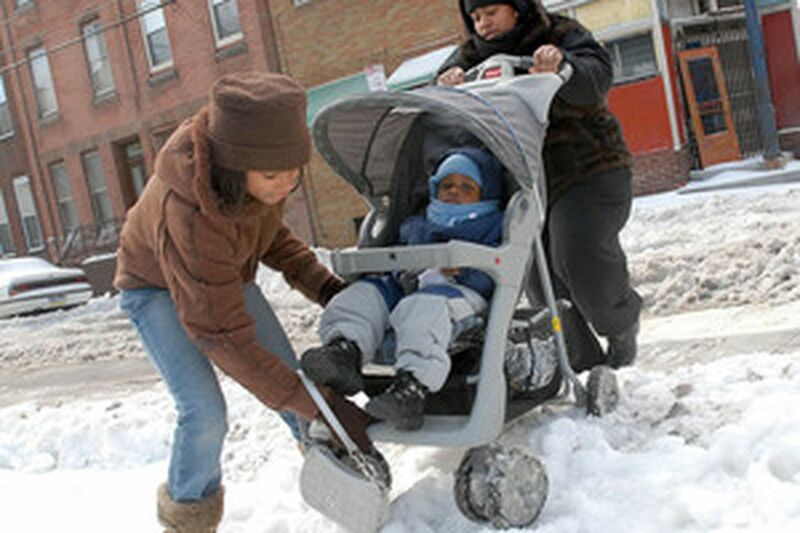 Cierra Hines, 12, helps lift Collin Hines' stroller, with mother Denkei Lawson at 15th and Mifflin in South Phila. It wasn't just your block. An ankle-deep mix of snow, ice and dirt lingered yesterday on city roads - big and small, from South Philadelphia to the Far Northeast - well into the afternoon, and residents asked: Where are the plows? In their garages, at least until much of the storm had passed. The mess created by the plows' later start infuriated taxi drivers, florists making Valentine's Day deliveries, and other motorists who could not fathom how a foreseeable and relatively minor storm could so severely cripple Philadelphia's roadways. "It's a disaster," said 29-year-old cab driver Ahmed Beladi. "Look at Broad Street. Look at Market Street. These are main streets." "I blame the mayor, it's his job," Beladi continued. "This is the worst city I've ever worked in. Other cities, they prepare." Beladi's cab had been slipping and sliding along city streets all morning. Conditions were so poor, he said, that other cab drivers were passing up sure fares and heading home. At 12:30 p.m., he did the same. City Managing Director Pedro Ramos said the later start was intentional. "There is a method to this madness," he explained. As the storm approached, the city prepared to confront an ice storm, not snowfall, Ramos said. That meant the focus was on salting and brining streets. Though salting was under way as early as Monday, plowing did not begin until 4 a.m. yesterday, and did not ramp up in earnest until after rush hour. "Our priority was getting people to work without having them drive on a 135-square-mile ice skating rink, which is what you would have had if you'd tried to plow too early," Ramos said. Snow plows in those conditions, he added, become "Zambonis." Another taxi driver, however, didn't see it that way. "I have never, to my recollection, seen it this bad," Phil Cantor said, calling the streets "an abomination." Department of Streets Commissioner Clarena I.W. Tolson said things would be better today. "We ask for the patience of our citizens," Tolson said, predicting that roadways would be clear in time for this morning's commute. "It was all hands on deck for this event," she said. The city used 170 trucks and 375 employees to salt and clear roadways, Tolson said. Those numbers represented almost all of the department's available equipment and personnel. Had the storm merely swept into town and quickly dumped a few inches of snow, the streets would have been cleared far earlier, Tolson said. But the storm's unusually long duration and the mix of snow, sleet and freezing rain made it unusually challenging. The forecasts were also a little off, she said. They had called for higher overnight temperatures, leading city officials to expect rain. Instead, they got more sleet and snow. Reports of plows clearing the slush off some major roadways began to come in around 2 p.m. Before that, though, there was heavy slush accumulation on thoroughfares across the city: Spring Garden, Vine, Walnut, Girard, Chestnut, Belmont, Montgomery, Lincoln and many others. Considering that experienced cabbies could barely navigate the roads, Temple University law student and winter-weather newbie Chris Hobbs wasn't about to drive from his home in Manayunk to classes in North Philly. "Most of the streets around here haven't been plowed, they haven't been touched," the Manayunk resident said about 2 p.m.
Hobbs, who grew up in Phoenix said he had spotted one salt truck on a larger street. "The driver was pulled over and getting a cheesesteak," Hobbs said. Rose McClarin, who lives in the Northeast, said the slush was thick even on snow-emergency routes and near fire stations. "This is unsafe and unacceptable. Just where, exactly, were the snowplows if they weren't plowing the snow emergency routes?" she wrote in an e-mail. "This is one of the reasons my husband and I are planning to move out of the city – enough is enough, we get no service for our tax dollars." Yet few residents and commuters were lodging their complaints with city authorities. The Streets Department said it had gotten only about 25 requests for additional salting and plowing, and even received a few compliments for its handling of the storm. A total of 19 snow-related complaints were made to Councilwoman Carol Campbell's office, but other City Council members said they heard from hardly any disgruntled constituents. Some of those residents couldn't help but to compare Philadelphia's roads with those in other municipalities. Commuters said rides that began smoothly in Lower Merion turned slow and soggy as soon as they crossed into Philadelphia. Beladi, the cab driver, took one fare to Wilmington, where he said the streets were well-plowed. Tolson did not want to compare Philadelphia's management of the storm with those of other governments, but she did say that weather conditions could have been different from town to town. What made the city's response surprising is that the Street administration has won high praise for its handling of some past snowstorms, most notably the January 2000 nor'easter during Mayor Street's first month on the job. The mayor canceled a trip to Washington and personally oversaw the city's snow-removal efforts. That same month, the city began plowing small side streets that had historically been left to languish. It took specially outfitted pickup trucks to get the job done. Contributing to this article were Inquirer staff writers Marcia Gelbart, Peter Mucha and Nancy Phillips.